If you’re looking for a truly excellent house cleaning service, Houston, TX, is just the place. If, on the other hand, you’re looking for a list of compelling reasons to hire a cleaning service, here they are! 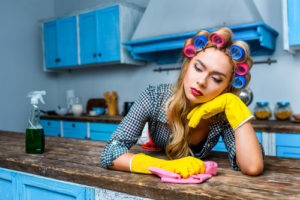 Although there’s no arguing against the most obvious one – it’s just easier to leave pesky chores to someone else – there are a few more equally strong reasons to consider. Free time is a precious commodity, even more so if you are spreading yourself too thin trying to juggle family life, housework, pets, a career, a healthy diet, workouts, and what not. At the end of a long day, you’re too exhausted to enjoy yourself doing the things you love and you end up wasting your weekends cleaning the house. Before you know it, it’s Monday morning and you have to repeat the whole thing yet again. Delegating house cleaning to someone else is the way out! Also on top of our list of reasons to hire a cleaning service is the effect of professional cleaning on reducing the amount of stress in our lives. Whether you’re an overworked parent or an ambitious career-focused overachiever, there’s no escaping chronic fatigue and constant pressure. We often don’t realize that even simple, seemingly harmless daily tasks like cleaning or doing the dishes contribute to our overall exhaustion. The tedious routines we follow every single day can cause us to eventually let ourselves go and burn out, having used up all our energy doing meaningless things. In the end, we’re too weak to do the things that used to excite us and bring us joy. If no one in your household has ever suffered from respiratory allergies, consider yourself lucky. Besides, neglecting nasty stuff like mold, dust mites, germs and the like is easier than tackling the problem. The bad news is that it’s never too late for our household to start having a detrimental effect on our health. Professional cleaning is a guaranteed and efficient way to turn your home into a wholesome, healthy environment. The best part: it requires absolutely zero work on your part. One of the most important reasons to hire a cleaning service is one that people often overlook. Deep cleaning is not a myth – it exists and it takes time, patience and skill. Unlike most of us, professional cleaners have the tools, supplies and expertise to perform cleaning tasks thoroughly and comprehensively. Remember that it’s also their job, so they will focus all their energy on giving clients the best value for money. What’s more, like with any job, not all of us have what it takes to do it properly. Who needs reasons to hire a cleaning service when you have Big City Maids! Big City Maids offers a wide range of unrivaled professional cleaning services. To live up to our fine reputation in the house cleaning industry, we are committed to delivering outstanding quality of service. We strive to meet and aspire to exceed our clients’ expectations every time. Allow us to impress you by working our magic!